What if the nWo works WrestleMania 35? The nWo is running a reunion tour. What if they carry it all the way to WrestleMania? Not long ago, Hulk Hogan was welcomed back into the WWE fold. He was formally reinstated to the company’s Hall of Fame, and welcomed back into the family to do ambassador work and open the door to on air appearances. It was a big, but not totally unpredictable development. Yes, there was shock and severe backlash against him after a tape came out of him using racist epithets. Hogan is part of the bedrock of WWE, though, and given the tapes were from years back, it made reasonable sense WWE would bring back The Hulkster after tensions had cooled off a bit. Hogan, Scott Hall, and Kevin Nash have recently been promoting a reunion tour that includes question and answer sessions and autograph signings for fans. 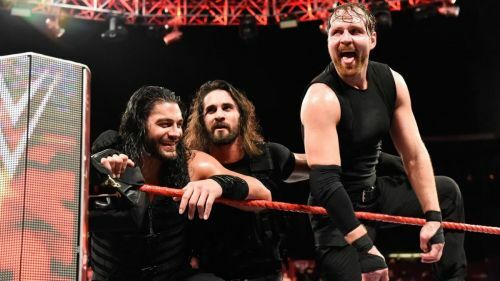 With all three men in WWE’s good graces and working together, it raises the question, could we see the New World Order on WWE television again? Moreover, is it possible the original trio could work a match at WrestleMania? This article looks at five potential outcomes if WWE booked it. A segment or two may feature two of wrestling's most iconic trios. 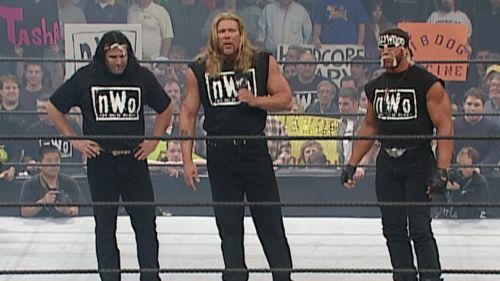 Since the New World Order launched its reunion tour, they have made it a talking point on social media to ask fans who they think would win a match between the nWo and The Shield. It’s a bit of a silly question as they’re from different generation and worked different styles. Nonetheless, the query makes a degree of sense in comparing the hottest trio from the 1996 to the hottest trio from today. Actually staging a match between the nWo and The Shield would probably be the wrong call. Hogan, Hall, and Nash aren’t in any shape to work a full-fledged, full contact bout nowadays, and it would be squandering three of WWE’s biggest stars for them to work a quick squash or a softer match to protect the legends at the biggest show of the year. It would be a missed opportunity not to have the factions interact, though, be it in a shmozz match on Raw, or just in promo segments either backing each other up or engaging in a war of words.